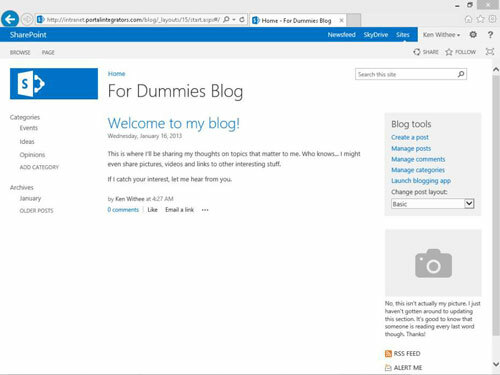 To create a blog in SharePoint, you create a new site or subsite. Take the time to consider where this blog will be located in your site hierarchy. Although you can change permissions at any level, it may make more sense to have your president’s blog on the main site of your SharePoint intranet (and open to all users of the site hierarchy), but perhaps your manager’s blog should be created as a subsite of your team site (so that permissions can be inherited from the team site). Navigate to the Site Contents page by clicking the Settings gear icon and choosing Site Contents. The Site Contents page appears, showing all the apps in the site. Scroll down to the bottom of the page to the Subsites section and click New Subsite. Type a name, description, and a URL for the site in the Name, Description, and URL text boxes, respectively. In the Template Selection section, choose the Blog template located under the Collaboration tab. Notice that there are different site templates to choose from. Keep the default to use the same permissions as the parent site. You can also choose unique permissions if you want to break the inheritance of permissions for the blog site. In the Navigation Inheritance section, you can choose to use the same top link bar from the parent site or use a unique top link bar. If you use the same top link bar of the parent, then you can navigate back to the parent site from within the blog. If you do not use the same top link bar, then the blog will appear isolated. You can always manually add navigation to the top link bar as well. You see a message that SharePoint is working, and then your new blog appears. Click the Create a Post button (under Blog Tools on the right side) to add a new entry to your blog. The home page of the blog site shows a Welcome to Your Blog default post, a list of Blog tools for posting, a place for your picture, and RSS Feed and Alert Me buttons. The site content includes a Photos app, Categories app, Posts app, and Comments app.